There's more news from the CeBIT show that just ended this past weekend in Germany regarding the Hauppauge HD-PVR - a device that will let us record digital television straight from any component video output like a cable box, satellite box or even that HD mentioned first in this post and then again in this one. Why is this device so exciting? Any analog video out of your typical HD set-top box has been termed the "Analog Hole". This term was coined by those in the industry as one way people could get HD content isn't protected from being copied or moved in any way. The HDMI digital connection that are quickly becoming the standard do protect the content so component out was the only loophole. Thus far, it has been nearly impossible to record encrypted digital channels (think ESPN HD or HBO etc) to your Home Theater PC unless you have purchased a pre-configured, Microsoft Vista Media Center computer that has CableCard tuner/s pre-installed. This was expensive and inflexible - especially if you prefer other HTPC programs such as SageTV, Beyond TV, GBPVR, Media Portal, Meedios or MythTV. With this device, if it works as expected we'll be able to plug it into the outgoing component outputs of any HD device such as a cable box then tune and record that HD content. The official name isn't known yet, but it's called the HD PVR at the trade shows - could change at release date. Accepts component video in "up to 1080p"
The hardware is finished and possibly already in the hands of several HTPC software makers for testing with their software programs. The case was still being finished at last report. Based on a chip from a company called Ambarella. This same chip is used in the Gefen HD PVR, the coming-soon Slingbox Pro HD and a few other devices yet to be released. The chip is an all-in-one chip with a digitizer and H.264 encoder - a similar chip from the same chip manufacturer is used in many popular HD camcorders. Hauppauge will reportedly have Windows and Linux drivers for the device although no confirmation on when the Linux drivers will be available. Will include an IR blaster with code library for controlling cable and satellite boxes. Included software reportedly will be Total Media Extreme, and a media converter from Arcsoft. Will connect to your PC via USB2 port. Will be in the form of a USB stick of some sort. Hauppauge will reportedly have Windows and Linux drivers for the device. Make backup copies of content from Blue-ray players or for those of you poor souls with the already extinct HD-DVD players. If you're using it to view and record from a cable box or satellite box, you'll still have to deal with an IR blaster to change the channels. This creates a few usability issues, but not a show stopper. I'm wondering what the minimum hardware requirements will be. It looks like the device will do the heavy-lifting, but I wonder if it will put an extra load on the recording PC? "The new Hauppauge HD-PVR is a plug-in USB stick with a built-in H.264 HD encoder to view and record HD video on a PC. The package also includes software to create HD disks for playback on a Blu-ray player. The new HD-PVR stick can encode 720p and 1080i HD sources at up to 13.5 Mbps on the fly to the PC's hard disk. Available at the end of March for 199 euros, the HD-PVR stick is also supplied with Arcsoft PC authoring software that can burn video HD DVDs for playback in Blu-ray players." I'm intrigued by the fact they call it a "USB stick" as it sounds like the device will be quite small. It also mentions that the package will include software to create HD disks for Blu-ray player playback - a function I hadn't even thought of before. Included software reportedly will be Total Media Extreme, and a media converter from Arcsoft. While I've heard rumors the device won't be available until April or May in the States, the article by Pocket-lint says their saying it will be ready in March 2008 in Germany so I'll be watching this one closely and report back to you as soon as I hear more. If anyone gets their hands on a photo of the device, be sure to let me know. "Apart from it containing .AAC audio (and not .AC3 audio), it does not seem unusual. The "interlaced" AVC video is on PID: 0x1011 and the AAC audio is on PID: 0x1100 (which is .M2TS PID compliant). I'm able to play the sample file in software using FFdshow's filters with MediaPlayer Classic. VLC player (v0.8.6d) crashes because it's AVC decoder does not support MBAFF or PAFF interlaced sources." OTHER COMPONENT VIDEO RECORDING DEVICES ON THE HORIZON? Dave Zatz got his hands on a somewhat similar device, the Gefen HD PVR. It's already available, costs $1000 and is different in that it is a self-contained PVR that records only to its own hard drive. You can however save to a USB-connected drive I believe. EDIT: Zatz says there is no USB or network ports on the device so that's not possible on the Gefen. The Gefen device also does h.264 hardware encoding and captures off of Component and HDMI (HDCP Compatible). For HTPC users like me the Gefen device isn't all that useful since you'd need to copy any recordings off of the device onto USB, move them to your HTPC machine, and then import them, but it's at least similar hardware as it uses a similar chip (Another similar chip (TI chip?) 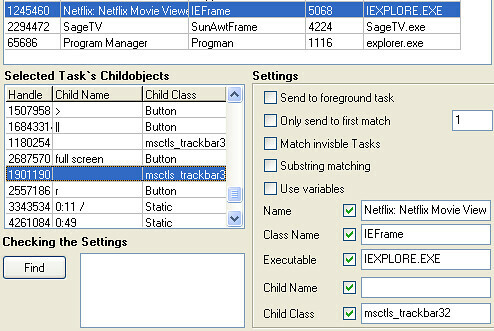 is used on the upcoming Slingbox Pro HD.) Looks like we'll might see more of this type of thing to come. There's at least one other device I've been hearing about that does component video recording and is being designed for HTPC's. I'll report more on that once I've confirmed more on it. You can control Netflix Watch Now playback with your remote. All you need is a remote control, a infrared receiver like the USBUIRT and a program like girder. I'll show you how I'm doing this and share with you my girder gml file which you can download as well. I've been using the Netflix Watch-Now feature more and more lately mostly because of the excellent Netflix plugin for SageTV that allows me to browse, search and play the Watch-Now movies from the comfort of my couch using my remote control. 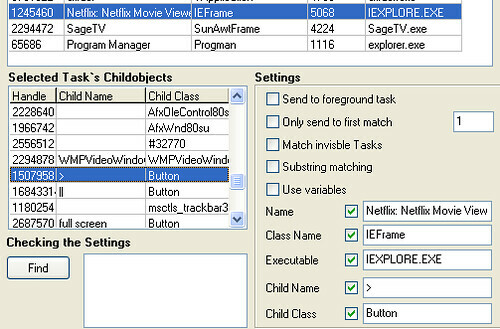 The SageTV plugin has been improved by Morgan (the plug-in developer) but once you start a movie or show I there were still some issues controlling everything without pulling out a keyboard and mouse. 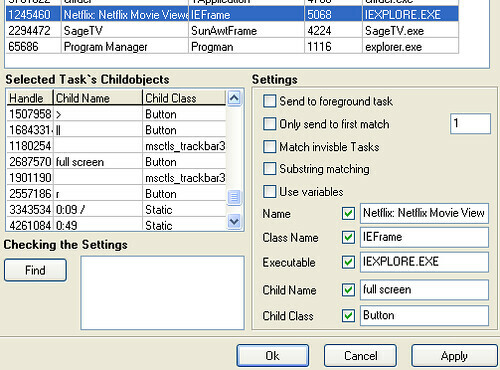 This has been a stumbler due to the fact that Netflix has very few keyboard shortcuts for the service. Today I've been tinkering with a program called girder that I use to make my remote control communicate with my PC. 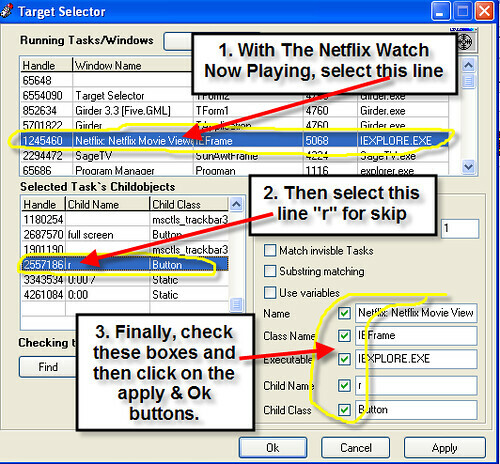 And in doing so I discovered a few hidden windows commands that give you more control over the Netflix Watch-Now feature. Next - Skips to the next track for television shows and other multi-disk titles. Previous - Skips to the previous track for television shows and other multi-disk titles. Play/Pause Toggle - this is executed with a single mouse-click anywhere on the screen (only works during full-screen playback) If you use the pause command as opposed to the keyboard shortcut, this was the only way to initiate play after that. Exit - Girder executes a close ie.exe command to completely close the watch-now window and go back to SageTV. 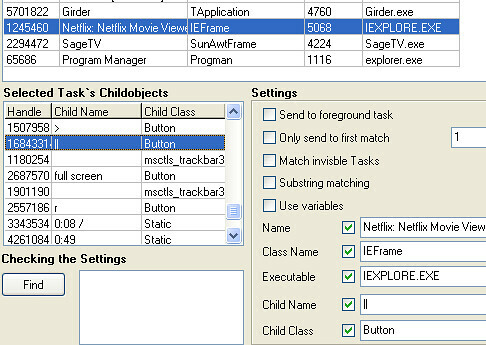 For those of you who want to just download the Netflix Watch-Now girder file here. First the girder basics. Be sure you enable the SendMessage plugin. I also enable the USBUIRT plugin since I use the USBUIRT to receive infrared commands from my remote. Next, add a girder command and click on the plugins tab. Here you need to select the "sendmessage" plugin with your mouse and then click on the "Target" button. 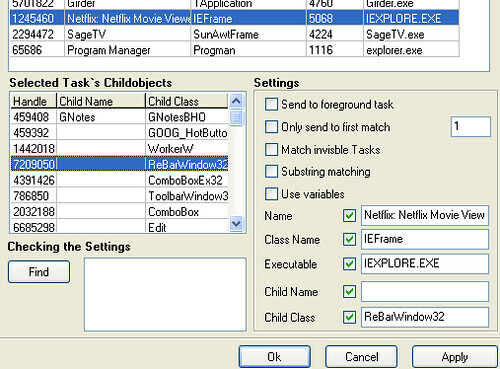 This one "ReBarWindow32" was for the previous button. This one was for the mute button. The Full Screen command - probably the most useful of all as it opens the playback in full screen and toggles back to windowed if you need it to. That's about it. Hopefully some will find this information useful. For the rest of you I've just proven how geeky I can be :) Either way, we're getting much more of our moneys worth out of our Netflix subscription by watching a lot more of the Netflix Watch-Now titles. If you live in most parts of the United States and Canada, Daylight Savings Time (DST) went into effect early this morning, Sunday, March 9, at 2:00 a.m. local time. 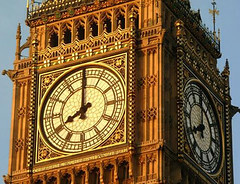 Be sure your clocks were moved forward one hour. And don't forget to check your computers - especially your Home Theater PC's since the time on those has to be correct to record shows at the correct time. Microsoft has a Daylight Saving Time Update Guide to guide users of Windows 2000, XP, Server 2003, Vista and Windows Mobile users through a Q&A format designed to pinpoint what updates, if any, need to be applied. Most computer users have already downloaded the required update if they have automatic updates turned on. To keep all of my HTPC computers on time to the second, I use a little add-on program that checks one of several official time servers at an interval I set. It works better and is more configurable then the Windows time server. Speaking of time, I wanted to check this morning to be sure I had the correct time so what did I do? I googled it of course and in doing so I noticed a relatively new google feature. Here's a screen-shot of the first result of the search "what time is it"
I don't live in Riverside, but fairly close. And it showed the correct time for each time zone for me. Those google folks just keep adding stuff don't they?